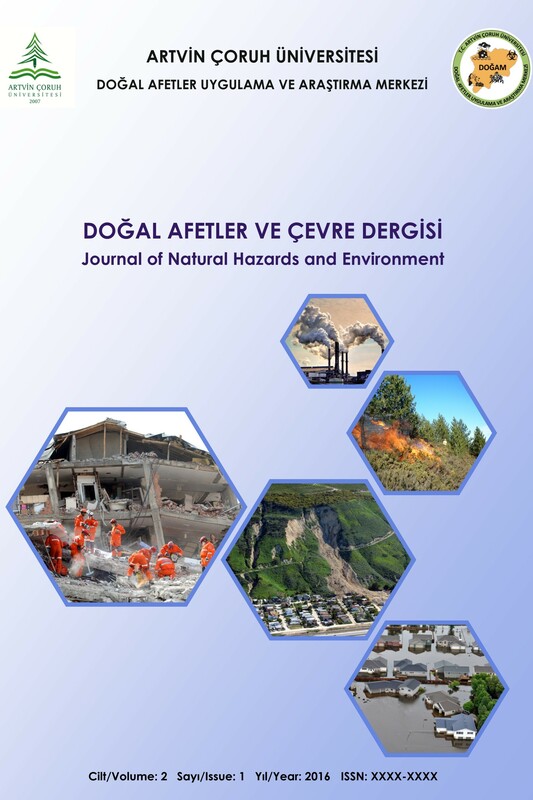 Journal of Natural Hazards and Environment (JNHE) is published by the Natural Hazards Application and Research Center of Artvin Coruh University. JNHE is a high-quality open access peer-reviewed research journal publishing original research articles and reviews on all subjects related to both natural hazards and the environment. The aim of the Journal of Natural Hazards and Environment (JNHE) is to provide researchers a qualified scientific publishing platform for their research focusing all subjects related to both natural hazards and environment and to contribute sharing of current scientific development and knowledge with the scientific world. The scope of the Journal encompasses research subjects including natural hazards, environmental studies, disaster management, pollution (air, water, soil, and noise), and climate change and global warming, together with research on new techniques. Some of the relevant topics and disciplines are earthquakes, landslides, rock falls, avalanches, flooding, flood, storms, erosion, drought, fire, biological disasters (such as epidemic diseases and insect infestation), climate change and global warming, disaster management, early warning systems, pollution (air, water, soil and noise), water and wastewater treatment, waste management (solid, medical and hazardous waste), watershed and water quality management, environmental impact assessment, renewable energy resources, Geographic Information Systems (GIS) and remote sensing applications on all issues related to natural hazards and environment. All articles submitted to the journal is firstly evaluated by the editorial board and if it is suitable, it is reviewed by at least two academic reviewers chosen by the editorial board. JNHE uses double-blind review, meaning that the identities of the reviewers and authors are concealed from the reviewers, and vice versa, throughout the review process. The reviewing process of the manuscripts that are out of the Journal’s scope and not related with the subjects or not prepared in the format outlined in the author guidelines cannot be started. Journal of Natural Hazards and Environment (JNHE) is abstracted and indexed in ULAKBIM TR Dizin, JournalSeek, Open Access Library (OALib), Open Academic Journals Index (OAJI), ResearchBib, RootIndexing, SciLit, Scientific Indexing Services, Science Library Index and Scientific World Index.